Dietrich Bonhoeffer’s classic 1937 book, The Cost of Discipleship, describes cheap grace as the preaching of forgiveness without requiring repentance, baptism without church discipline and communion without confession. It's the sort of grace that allowed would-be disciples to avoid confronting the evils of Nazi Germany. These days, cheap grace has competition. In an effort to appease a different kind of cultural complacency, grace has come to mean a bar that is set quite low. Offering this grace requires little to no accountability, enforces few if any standards, and bears almost no fruit. In churches, this low-level grace is most apparent in our communal and organizational life. It translates into a kind of laissez faire, you're off the hook, no accountability stance. This isn't cheap grace. It's worse than that. It's mediocre grace. 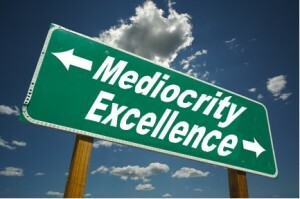 But mediocrity is not a biblical value. Jesus killed trees that bore no fruit. He spit out the lukewarm. He counseled followers to let their yes be yes and their no be no. When it comes to perpetuating a culture of mediocrity in churches, there's plenty of blame to go around-- from the system, to pastors, to lay people, to denominationalism itself. Not to mention the larger culture that is rapidly changing, and lives that are overly busy. The list is long. But you know the old saying: If you’re pointing a finger at someone, there are three fingers pointing back at you. The truth is church culture can be shifted. But not by blaming others.